GALWAY, Ireland — France’s Groupama Sailing Team crossed the finish line in the pitch black Galway night July 2 to secure a remarkable overall victory in their debut Volvo Ocean Race campaign and finally settle the closest contest in the event’s 39-year history. While Camper with Emirates Team New Zealand was celebrating victory in the ninth and final leg of the eight-month-long 39,000-nautical mile Volvo Ocean Race, Groupama skipper Franck Cammas led his team home in second place to take an unassailable 24-point lead, with just one in-port race to go. Cammas, the 39-year-old Frenchman, threw his arms up and pumped his fists in the air while tens of thousands of fans gathered on the dock of Galway Bay to cheer the team — including Irishman Damian Foxall — on to a remarkable victory in their first appearance in the race. For Camper, notching up their first leg win of the race was a longed-for achievement and it all but guaranteed they would finish second overall. Puma Ocean Racing Powered by BERG, in third place on the night, would go on to finish behind them in third overall after July 7’s In-Port Race. Not since Lionel Péan skippered L’Esprit d’Equipe to victory in 1985-86 has a French team tasted glory in sailing’s toughest challenge. “This is an incredible moment for me,” Cammas said. “It was always my dream just to participate in this race. The first book I ever read was about the Whitbread. It has been an incredible day for me, and it hasn’t sunk in yet. The team overcame a stream of challenges during the epic race, including a testing first leg, disappointing results in the early in-port races and the loss of their mast in Leg 5. Despite the setbacks, Cammas and his crew continued to improve, pulling back from a 28-point deficit after the Sanya Haitang Bay In-Port Race to take their first offshore win in Leg 4, arriving into Auckland first despite the discovery of a serious crack in the hull within 100 miles of the line. They finally usurped long-term race leaders Team Telefónica from the top of the standings at the end of Leg 7. Subsequent wins in the Oeiras In-Port Race in Lisbon, Leg 8 (from Lisbon to Lorient) and the Bretagne In-Port Race only served to cement their position at the top of the leaderboard and bolster the team’s confidence heading into the final two scoring opportunities. Despite going into the final 550-nautical-mile leg from Lorient to Lisbon with a 25-point margin over second-place Puma, overall victory was far from guaranteed as the six boats set sail from Groupama’s home port of Lorient bound for Galway. With early race leader Telefónica looking to recover the form that saw them win the first three offshore legs, Puma wanting to better their second-place overall finish in the 2008-09 race and Camper with Emirates Team New Zealand itching to score their first offshore win, the pressure was on the frontrunners from the start. But with breezy reaching forecast for the sprint out of the Bay of Biscay and across the Celtic Sea, conditions in which the team’s Volvo Open 70 Groupama 4 excels, they were always going to be a force to be reckoned with. Groupama only needed to finish fourth to secure overall victory. But they went two better, seeing off challenges through wild conditions in the English Channel and around the iconic Fastnet Rock. They finished second across the line at 00:49:11 UTC, seven minutes behind Camper, and sealed their place in the history books as race winners. While Groupama was celebrating overall victory in the round-the-world race, they were denied what would have been a unique offshore/inshore double, as Puma held on for the win they needed to capture the inshore series trophy in the final In-Port Race on July 7. Puma, wearing Ireland rugby shirts, scored six points for the win in the In-Port Race Series, taking their in-port total to 45 points and breaking their tie with Camper with Emirates Team New Zealand at the top of the inshore rankings. Camper finished second, to take second place in the 10-race series, with 44 points. 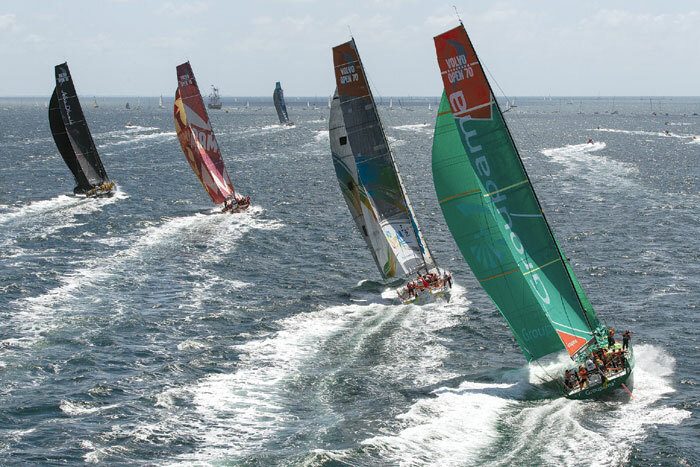 The longtime overall leader Telefónica finished third, followed by Groupama, who finished fourth in the inshore series. Abu Dhabi Ocean Racing finished fifth and Team Sanya took sixth. Thousands of fans aboard hundreds of spectator boats watched as the fleet tussled for the final time on the 8.2-nautical-mile inshore course in overcast and wet conditions. They weren’t disappointed, as the fleet battled throughout in the final sail for the Volvo Open 70 boats before the race switches to a new 65-foot design for the Volvo Ocean Race 2014-15.